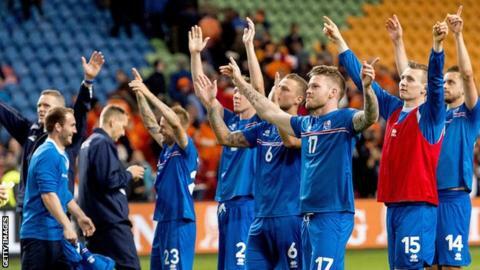 Iceland sealed their place at a major tournament for the first time as they secured the point they needed in their Euro 2016 qualifier against Kazakhstan. Iceland and Czech Republic both progress from Group A, with Netherlands now unable to advance automatically. Cardiff's Aron Gunnarsson, the Iceland captain, who was dismissed late on, said: "It's unbelievable, I'm shocked." The island nation is the smallest to qualify for a Euros, with an estimated population of just 317,000. Before the match, manager Lars Lagerback said qualifying would mean more than reaching eight successive finals with his native Sweden, who he managed for nine years. Iceland have moved up 100 places in the Fifa rankings since Lagerback took charge in 2011 and now sit in 23rd position, above the likes of France, Ukraine and Russia. Match ends, Iceland 0, Kazakhstan 0. Second Half ends, Iceland 0, Kazakhstan 0. Attempt blocked. Samat Smakov (Kazakhstan) right footed shot from outside the box is blocked. Second yellow card to Aron Gunnarsson (Iceland) for a bad foul. Aleksey Shchetkin (Kazakhstan) wins a free kick on the left wing. Foul by Kolbeinn Sigthorsson (Iceland). Substitution, Iceland. Vidar Orn Kjartansson replaces Jon Dadi Bodvarsson. Aron Gunnarsson (Iceland) is shown the yellow card for a bad foul. Islambek Kuat (Kazakhstan) wins a free kick in the attacking half. Substitution, Kazakhstan. Aleksey Shchetkin replaces Tanat Nuserbaev. Alexander Merkel (Kazakhstan) is shown the yellow card. Foul by Mark Gurman (Kazakhstan). Attempt missed. Jon Dadi Bodvarsson (Iceland) header from the centre of the box is close, but misses to the right. Assisted by Johann Berg Gudmundsson with a cross following a set piece situation. Jon Dadi Bodvarsson (Iceland) wins a free kick on the right wing. Corner, Iceland. Conceded by Yuri Logvinenko. Attempt blocked. Gylfi Sigurdsson (Iceland) right footed shot from outside the box is blocked. Birkir Saevarsson (Iceland) wins a free kick on the right wing. Foul by Tanat Nuserbaev (Kazakhstan). Offside, Iceland. Ragnar Sigurdsson tries a through ball, but Kolbeinn Sigthorsson is caught offside.